I'm constantly on the lookout for ways to entertain my toddler. If I happen to find something exciting for him to enjoy which also contains a good lesson or teachable moment, that's all the better! I'm especially fond of good Bible storybooks to read with him - but if I am honest, it's kind of a challenge because most of them don't feature his great obsession: cars and trucks. 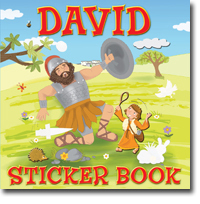 Enter a fun new book we recently discovered: David Sticker Book! Based on the Biblical story of David and Goliath, and written by author Karen Williamson, this short book recounts the tale in just twelve pages (a perfect length for a very young reader or listener). The illustrations have a friendly and somewhat whimsical flair and are sure to capture the attention of a child. The fun element of this book is that it comes with four pages of stickers for the reader to add to the story! The sticker design is great - each sticker has a specific place in the book, and these spots are printed lightly so that children can easily match the correct sticker to its place. Our two year old loved looking at the photos, but didn't quite grasp the concept of stickers yet. I imagine he will have a grand time finding the right place to place each one when he is just a little bit older. 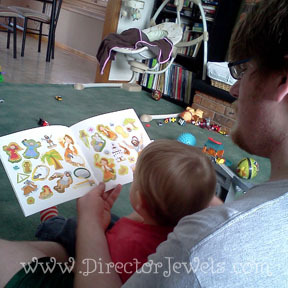 The book contains enough stickers to keep a little one entertained for quite some time - and even after all the stickers have been placed, the book can be read over and over again! One of the best features is that the story includes the Biblical reference to David's story. I don't recall seeing this often in children's Bible books, and I think it is a wonderful addition. You can purchase the David Sticker Book from Amazon (current price is $5.39).